De Rosa's Neo Primato Azzuro Ferretti. Bringing back a new supremacy! When I first saw the Neo Primato, 'New Supremacy' by famous Italian framebuilder De Rosa... I salivated. I had to have a bib on. It was almost embarrassing. 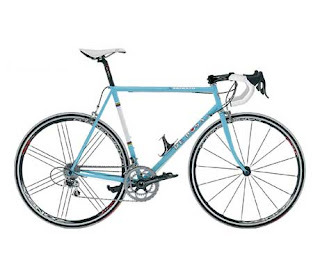 But, after I got a hold of myself I realized that De Rosa offers this beautiful steel gem in three historical team inspired color choices; Red-Faema, black-Kas, and my favorite; blue-Azzurro Ferretti. Italian pro team Ferretti operated from 1969-1972 and had their share of top riders. The Swedish Pettersson brothers were amazing. With Gösta Pettersson notably winning the 1971 Giro d'Italia. Also, Italo Zilioli's fine victory in the 1971 Tirreno-Adriatico. And long considered in Italy as a campionissimo, Gianni Motta entered the squadra in 1972. Team Ferretti wanted the great Motta to hopefully revive his past winning ways .. but to no avail. He won many races; 1964 Tour of Lombardy, 1966 Giro, 1967 Tour of Switzerland, 1966, '71 Tour of Romandie. In 1967, the naive Motta entrusted himself to an eccentric doctor to follow an insane training program of the American astronauts. It never worked. His only season with Ferretti brought Motta close coming in second in Milan-San Remo. However, Ferretti officials also knew that if Motta couldn't win then he would at least bring cachet. If anything, the De Rosa Neo Primato, brings back that certain cachet. Prestigious riders coupled with a great cycling past. And I have to admit that I love that inspiring sea blue color! 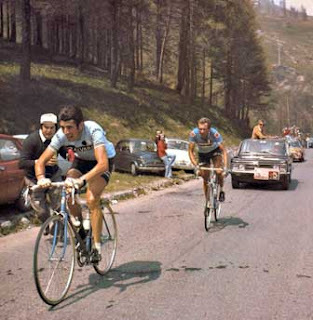 The 1972 Giro: Gimondi chased by Motta. From: The Fabulous world of cycling. 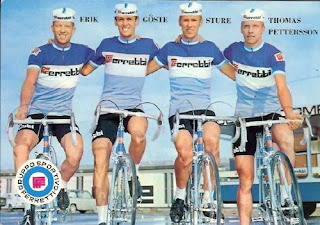 The Pettersson brothers from 1970 with their Ferretti blue bikes. Inset image: 1972, Gianni Motta posing beside his azzurro blue.